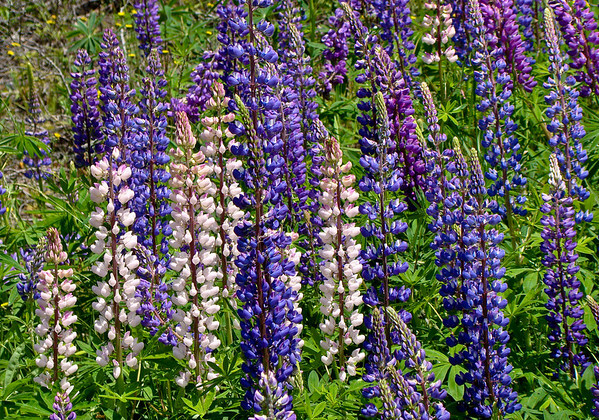 Lupines are impressive plants. A little research yesterday turned up the fact that they are grown as a food crop, both for animal and human consumption, in many parts of the world. The beans have to be soaked in salt water for several days to remove toxins, but after soaking they are used in dishes in Germany, in particular, around the Mediterranean Sea and through the near-East. 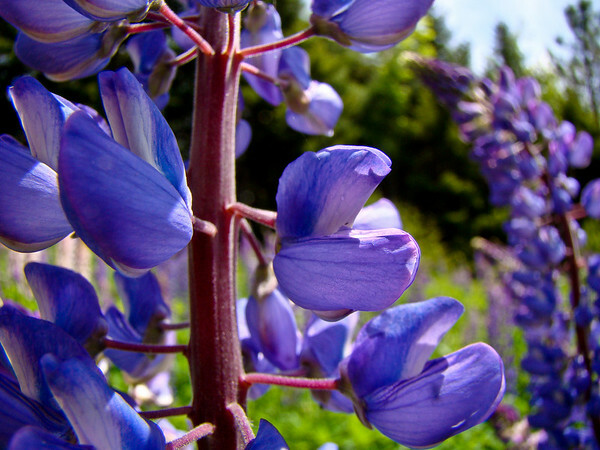 Native Americans in both North and South America harvested and ate the Lupine beans. This close up shot shows the finer detail of the flower structure, which is often obscured in the view of the massed flowers. Sony DSC H50 at full wide and macro. F5.0 @ 1/250th @ ISO 100. Programed auto. Cropped slightly in Lightroom for composition. Added Clarity and Vibrance. Blackpoint moved right. Landscape sharpen preset. From Mount Desert Island/Bar Harbor ME 2009. And, one more shot to show the variety of colors in this patch.